Pass SequenceEqual two Observables, and it will compare the items emitted by each Observable, and the Observable it returns will emit true only if both sequences are the same (the same items, in the same order, with the same termination state). 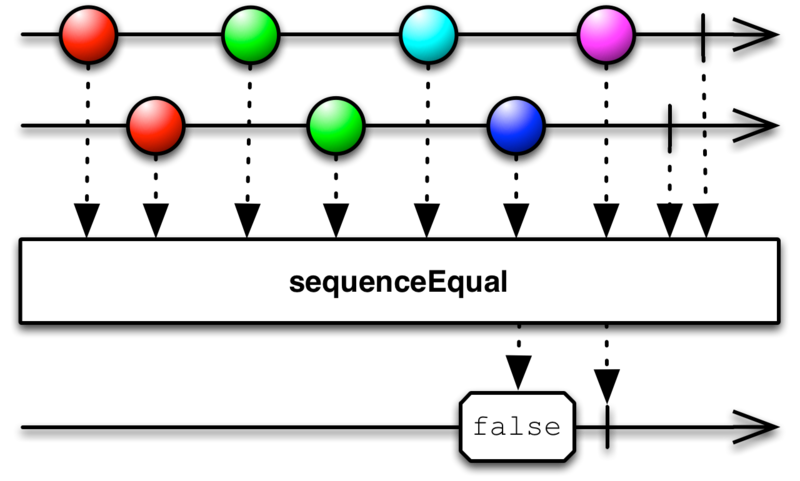 Pass sequenceEqual two Observables, and it will compare the items emitted by each Observable, and the Observable it returns will emit true only if both sequences terminate normally after emitting the same sequence of items in the same order; otherwise it will emit false. You can optionally pass a third parameter: a function that accepts two items and returns true if they are equal according to a standard of your choosing. This operator does not by default operate on any particular Scheduler. In RxJS, sequenceEqual is a method of a particular Observable instance, so you pass it exactly one other Observable to compare the instance to. You can optionally pass a second parameter: a function that accepts two items and returns true if they are equal according to a standard of your choosing. sequenceEqual returns an Observable that will emit a true if the two Observables emit the same set of items in the same order before completing, or a false otherwise.